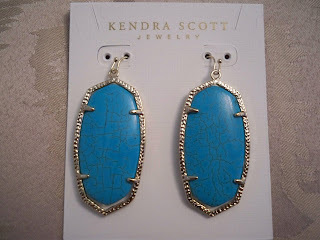 I admired Michelle's beautiful turquoise earrings designed by Kendra Scott, and made a note to order them. Then other items piled onto my wishlist and I forgot all about the pretty stone earrings. Until recently, when I saw them again appearing on blogs. How could I forget their beauty? I ordered mine here, after visiting the Kendra Scott website and waiting for the Danielle earrings to come back into stock. They come in a multitude of bright colors, the turquoise being my personal fave (and everyone else's too). I cannot wait to wear these tomorrow for my friend's birthday! Thanks, UPS man. You brought my earrings to me in the nick of time. 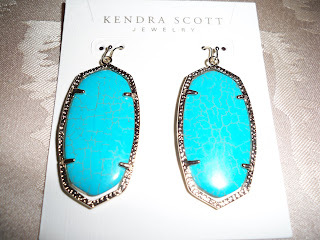 Jennifer: Kendra Scott makes lovely pieces, and in such a wide variety of colors too. I can see why you have more than one pair! YAY!! So glad you got these!!! Can't wait to see a pic of them on you. They're gorgeous. I was going to place a big order last month, but they were out of stock, so I never did it. These are still on my wish list-in any color--they're just all so beautiful. those are hot! reminds me of Bar Refaeli rocking torquoise at the MET gala. I DO love those earrings too! Are they expensive?? haha what a great UPS man!! Those look amazing - I love turquoise in the summer. I also admired the earrings when I saw it in my Stylewatch. Thank you girls! I can see they are popular by some of the comments! Andi: I have a feeling they may not be my last pair =) They would look stunning on you! Kim: They are about 60 USD I believe. I got free shipping on Max and Chloe too, an added bonus. I wouldn't say they are super inexpensive, but they aren't pricey either. Definitely worth it in my book! They are even better in person.